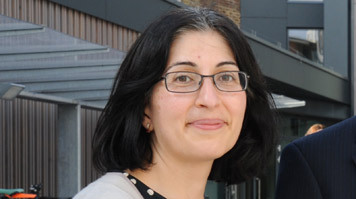 Whether as Senior Lecturer in Informatics or as the course director for the BSc (Hons) Business Information Technology, Dr Safia Barikzai has always encouraged her students to gain real-world experience and be enterprising. Through the support of Student Enterprise at London South Bank University (LSBU), she now serves as Enterprise Champion for the School of Engineering. "I have always considered myself enterprising without formally considering myself an 'enterprise educator'," says Safia. She began to formally focus on providing students with industry relevant experience when she took up the role of placements coordinator for Informatics students. While facilitating a placement, she discovered the Student Enterprise team and the Enterprise Champions programme. Enterprise Champions from LSBU's seven Schools work together to get students to explore their entrepreneurial potentials while developing employable skills. "Student Enterprise has enabled us as interested teachers to work together. We are always sharing resources and supporting each other, despite our heavy workloads," she says. "I feel it is my role to make connections with businesses and get our students to network with employers before they graduate. We need to grow our students' confidence so they can make the most out of the opportunities available to them." Safia also recently became a Fellow of the International Entrepreneurship Educators Programme, a national initiative helping educators to promote enterprise within their organisations. "I consider myself to have three roles: a teacher, a course director and an enterprise educator. I want to embed enterprise within LSBU curricula and get students to engage with the external world," says Safia. As an Enterprise Champion, Safia has run a variety of activities including the Employer Engagement series, which gets employers to work with Informatics students. "Entrepreneurs required technology solutions and our IT students needed to develop skills in presenting technology solutions, so we incorporated this within our curriculum," she explains. She has been involved in numerous multidisciplinary talks, workshops and projects, including the Start & Evolve series, the Investment Escalator scheme and the Informatics Student Society. Since starting as an Enterprise Champion, Safia has seen a marked difference in graduate successes and student involvement. "Working with the Student Enterprise team, we are able to nurture student and graduate entrepreneurs and it is rewarding to see their businesses grow and become sustainable," she says. Safia is showing no sign of slowing down and wants to widen academic participation in programmes like the Enterprise Champions, both within LSBU and the greater HE sector. "It's refreshing to see other educators' views. It makes you question your pedagogy and challenges you to think of the classroom arena in a different context. It encourages you to not be scared of trying out something new," she says. "I want more enterprise educator engagement, because it's what our students need. It helps regenerate the local area and truly makes us a civic university."